It doesn’t matter what alarm tone you set to wake yourself up in the morning but what if I told you can you also chose the smell you want to wake your senses for a refreshing start to everyday life. SensorWake is what is being called a smell generating alarm clock. 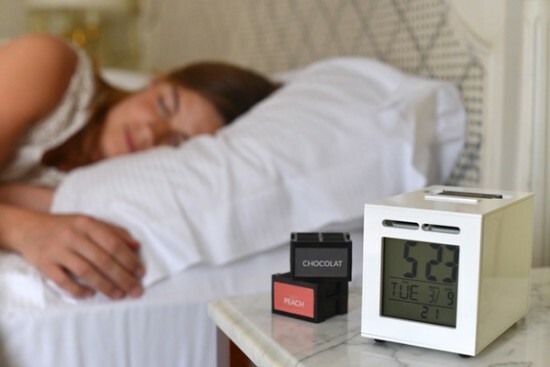 With this innovative alarm clock, users will be able to chose from a wide variety of scents such as the ocean, coffee, croissants etc. Guillaume Rolland is an 18-year old entrepreneur who is behind this interesting smell spreading alarm clock. It is also claimed that the smell generating mechanism is designed yo wake you up in under 2 minutes. All it needs is your favorite scent capsule which will last up to 60 awakenings or 60 times usage. And the good part about these capsules is that these are 100% recyclable. Currently the SensorWake is running a funding campaign via Kickstarter and has already exceeded its goal of €50,000.